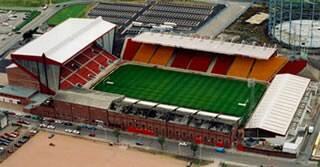 In 1978, Pittodrie Stadium became the first all-seated, all-covered football ground in the UK. Those were the days of the long wooden bench seating, which dramatically increased your odds of a broken leg if wild celebrations following a goal. Nowadays, individual seats are in place, so at least comfort and safety are better. Away fans are housed in the South Stand, with size of allocation and prices of entry dependent on opposition. Celtic and Rangers get a bigger section than the other teams, but they usually fill it (if they are winning). It may not be as modern as Ibrox, Parkhead or Hampden Park, but there is something special about this stadium. The atmosphere is simply exceptional, especially when the capacity of 21,634 is nearly reached. Away fans are normally allocated seating in the South Stand. Refreshments are decently priced, and the toilet facilities are some of the best, especially for women. There is a family section at the Merkland Road end, where, I believe, child away fans can be accommodated, but better to check up on this one just to make sure. Whether travelling from either North or South by coach or car, the route designated by local Police is signposted in plenty of time. Coaches are parked adjacent to the Beach, and visiting fans then have the usually muddy walk over the Broad Hill, or alternatively (and more sensibly) up Urquhart Road, then down Park Street to their allocated section of the South Stand. If you are a registered user then you can login, and create your own personal review of Aberdeen Football Club - Pittodrie Stadium. These reviews can be private or public.